The Stair-Robot® Express is a battery-powered stair walking device designed for everyday use. This compact and lightweight climbing stairs can take care of moving goods up to 175kg. 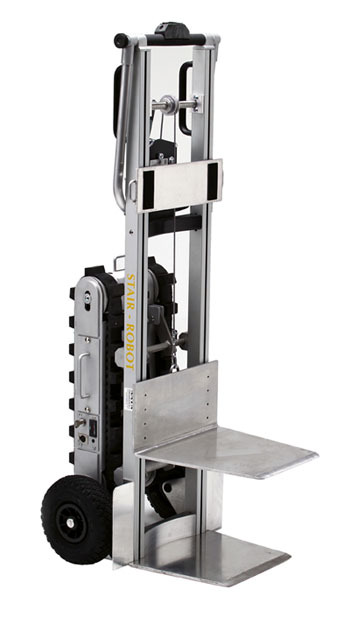 The drive unit can be use to simple lift up or down, with or without cargo from a van. The Stair-Robot® Express is designed for single work. The device has different driver-friendly features and options including a quick-change battery, remote control, different wheels, height-adjustable load platform and adjustable handles. The Stair-Robot® Express reduces the security risks while moving goods on a stairway and minimizes the physical demands of the driver. possible. 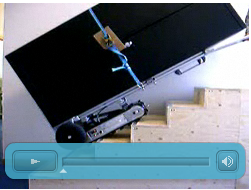 The Stair-Robot® Express , can lift up a load of 175kg for 20 steps on a single charge moving! The battery has a lifespan of 4 to 7 years. Full attention has been given to the StairRobot ® the most ergonomically friendly lift device on the market. Example: All controls are strategically on the top of the device placed between the handles. Unlike other devices on the market, the Stair Robot ® has exceptional qualities. for example, the Stair Robot ® has a hardened steel mandrel which, combined with the motor and battery provides for the best combination of strength, durability and effectiveness . The jump lock safety feature in the ball nut provides additional system security. The wheels of the Stair-Robot® can pull in and out, that way it reduces the total pressure of the machine on the stairs . Ideal for tight spaces like narrow staircases. This function also ensures that the effort required to move the load is significantly reduced. All Stair-Robot®stair climbers have this unique feature, as well as the Stair-Robot® Express. . As soon as you have your loads on you're machine you'll be in a good position without having to make any effort to keep the load balanced! This is very useful when your on the stairs for example if you have to open a door or when tou're phone rings. This would be impossible with an ordinary hand truck. All Stair-Robot® appliances are built with solid controls that reduce the use of the battery and thereby ensure that it last longer. Another advantage of the robust controls (unique in the industry) is the "soft start" feature. This increases security because the sudden movement occurs during startup. This results in a smoother operation of the device. The new controls are easy to maintain, easy as 1-2-3! All these features contribute to the lowest cost of ownership on the market. If you want to find out how an Express Stair-Robot ® can contribute to the safety and profitability for your business today cantact with one of our Solution Specialists. 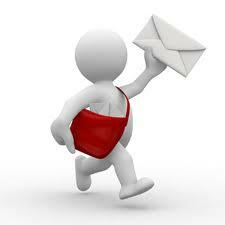 for advice You may contact a dealer of AATA International.